I had my first caipirinha on my honeymoon: influenced by my husband, I enjoyed the drink with him in a super hot day, by the sea. What a delicious day that was. After that, I became a caipirinha fan (but you know that already). :D I’ll admit it: I like a little bit of alcohol every now and then. 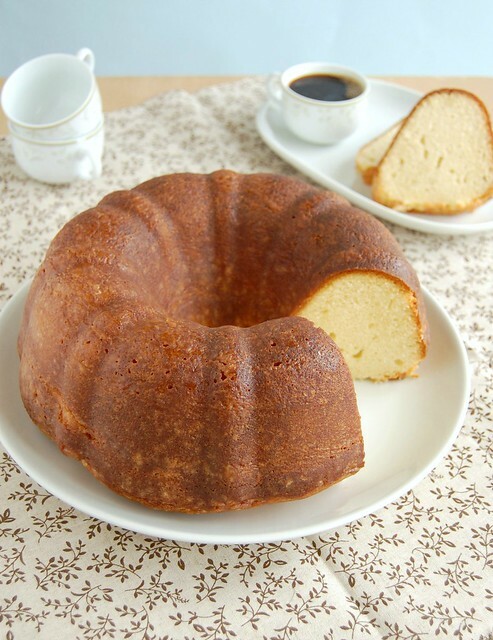 Therefore, once I started baking with rum there was no turning back – for that reason, one of the first recipes I tried with my new Bundt pan had to be Lisa Yockelson's butter rum cake: there’s rum in the batter and there’s more rum in the glaze. Yum, yum. The cake is very tender and rose beautifully despite the tiny amount of baking soda (and no baking powder). Definitely a keeper. Preheat the oven to 180°C/ 350°F. Butter a 25cm (10in) Bundt cake and dust with all purpose flour. Tap out any excess flour. Sift the flour, baking soda, salt and nutmeg in a medium bowl. Set aside. Cream the butter in the large bowl of an electric mixer on medium speed for 3-4 minutes. Add the sugar in three additions, beating for 1 minute after each addition. Add the eggs, one at a time, beating for 45 seconds after each addition. Scrape the sides of the bowl occasionally. Blend in the vanilla extract. On low speed, alternately add the flour mixture in three additions and the buttermilk in two additions, beginning and ending with the flour mixture. Scrape the sides of the bowl again. Add the rum and beat for 30 seconds. Spoon the batter into the prepared pan and smooth the top. Bake for 55 minutes or until risen, set and golden and a skewer inserted in the center of the cake comes out clean. Let the cake stand in the pan, over a wire rack, for 8-10 minutes, while you prepare the glaze. Glaze: place the butter, granulated sugar and rum in a small, heavy nonreactive saucepan. Set over low heat, stirring until the sugar dissolves and the butter melts. Bring to the boil, turn the heat to low and simmer for 2 minutes. Off the heat stir in the vanilla extract. Carefully unmold the cake onto a wire rack. Using a soft pastry brush, apply the warm glaze onto the top and sides of the cake. Cool completely before slicing and serving. yummy this bundt cake!! I have to try it!! I love rum cakes ... this one looks so soft !! This cake looks fantastic. I also like to bake with liquor, my husband said me one day that he dosen't like to taste liquors on the desserts, but that's not true, he always repeat a dessert when it is plenty of liquor. This looks great! I, too, love cooking with my favorite sprits. Have you tried Booze Cakes by Krystina Castella? It's a whole cook book full of this stuff! Mine started as a recipe with a box cake mix and pudding as part of the ingredients but I've fiddled and made my own scratch recipe which differs from yours a bit but the glaze? Exactly the same. And it's that glaze that makes this cake. Looks fabulous! Baking with booze? Yes please! Love this! Never had a caipirinha, but hooray for baking with booze, especially rum! I bet the buttermilk makes the cake extra moist. Love rum cakes! I also love rum-based cocktails ;) Cheers! I really could have used this recipe over Labor Day weekend! I wanted to make rum cake to go along with my "island" theme dinner. Instead I used Paula Deen's pound cake recipe, added rum to it, then made a rum glaze. It turned out very similar to yours so I bet it tastes awesome! Chef Room Mate, I don't have that book, but I do own "The Boozy Baker" - I have got to use it more often! Tks for the remainder! Hi Patricia! Sorry for the english, I only teach it. I want to say thank you for this recipe. I've been doing for about the same recipe cream cake without rum. But the taste was not very good, there was a lot of soda. And on your technology cake was very tasty and very soft, tall and handsome. I never thought that so important to follow the order of addition and mixing time! I learned a lot from you! Thank you! Barbara, the glaze in this cake is very special, too. Thank you! I was just looking for an easy cake to make along side a pie for Thanksgiving. This cake was SO GOOD. It was SUPER moist and there was just a hint of rum. Thank you so much for sharing - it was a big hit! Hey, Deanna! I'm so glad the recipe worked out for you and you liked the cake! Thank YOU for letting me know how it turned out! Hi Patricia, just made your rum cake today. It was fabulous! Thanks for the recipe. I will now make this cake very often! Hey, Purabi! I'm so glad you liked the cake - thank YOU for letting me know how the recipe turned out!